The MIPIM trade fair is the world’s largest property trade fair. For the first time London will be hosting the event (normally held in Cannes) with an opening address from our mayor, Boris Johnson. Given the estimated 340,000 households on the housing waiting list across London, the steady rise in homelessness rates and emergency housing in B&Bs and hostels (often for families and vulnerable individuals) it is clear we need truly affordable social housing and effective regulation of the private rental market. Instead of our politicians looking into a sustainable housing sector, we get the mayor opening MIPIM, with many councils keen to strike up lucrative deals with property developers. 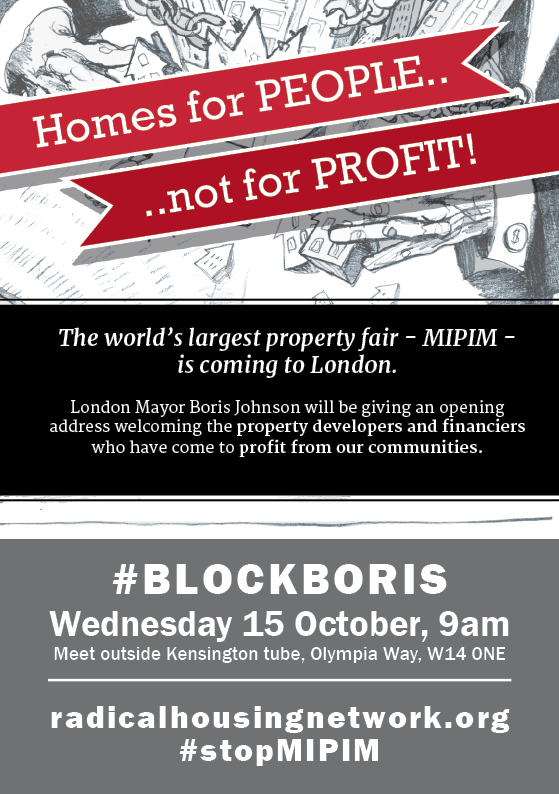 MIPIM will be a place to discuss further profiteering from the capital’s housing market, including some great talks such as “Social Housing: What’s the point?” and “NHS Restructuring: Opportunities for the Property Industry”. We need to send out a clear message: London needs to think of housing as a public right, events like MIPIM promise more of the same profiteering which has given us scandals like the Heygate Estate “regeneration” (http://www.urban75.org/blog/elephant-and-castle-regeneration-outrage-2535-new-homes-and-just-79-social-rented-units/), the almost now almost meaningless definition of “Affordable Housing” (http://www.theguardian.com/housing-network/2014/feb/03/affordable-housing-meaning-rent-social-housing) and Boris Johnson’s constant siding with luxury private developers against council’s protests (http://www.theguardian.com/artanddesign/architecture-design-blog/2014/jan/29/boris-johnsons-abuse-of-planning-power-is-an-assault-on-democracy). 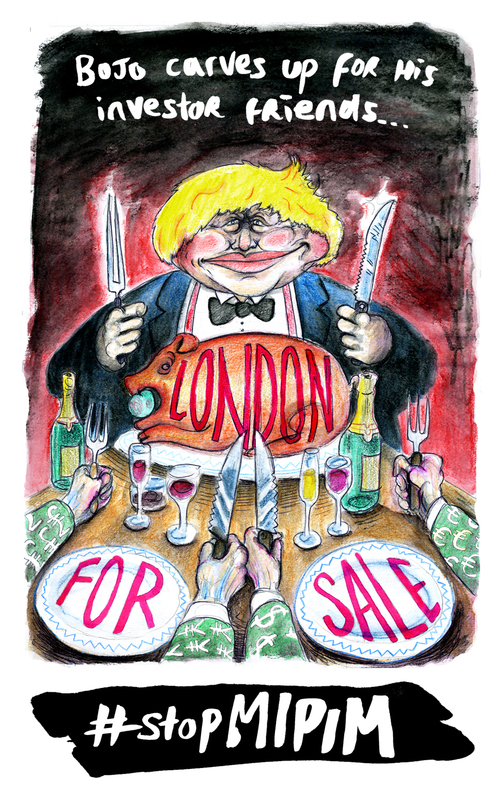 The surge in homelessness and soaring housing waiting lists doesn’t happen by accident, this is what happens when London only views housing as an asset, never a public right.